Val's Quilting Studio : May OMG: Eye-Spy Name Quilt Finished. May OMG: Eye-Spy Name Quilt Finished. As previously posted, I wanted to turn my last stack of Eye-Spy fabrics into a baby name quilt. A young couple we know are having their first baby in August: Kash Joel. Since this is my seventh stash busting project for the year, I got to play with a lot of fabric combos for the name plate. I finally settled on a solid black for the name and a fun pirate print for the background. 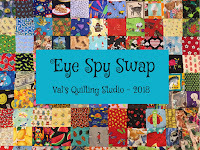 I think it works, especially for an Eye-Spy Quilt. This finish measures 50"x54" and though it's not our traditional baby quilt, we all know how babies grow way too fast and before we know it, he'll be cuddling under this quilty hug as a little toddler getting ready for an afternoon nap. Our grand guy continues to not only love his Eye Spy quilt but at four and a half, we had fun playing the game and trying to trick each other this past weekend! I used a soft, velvety minky fabric for the backing and a solid black for the binding. I thought the trains, trucks, helicopters and planes in my Go-Go-Go pantograph added to the whimsy of an Eye-Spy quilt for a little boy. hopefully become a favorite along the way. You will need 1/3 yard or a fat quarter, depending on the print, of ten different fabrics with recognizable prints within a 3 1/2" square for one spot in the swap. Click HERE to see examples of good and bad fabric choices. PS: Help Spread The Word! Add this button below to your posts and blogs. This will be a double swap...meaning with a maximum of 36 "swap spots" available, you'll be able to sign-up Friday for a maximum of two regular swap spots if you want...but the fabrics for each swap will need to be different. Okay...Happy collecting!! I hope you'll think about joining us. Your eye spy quilt finished nicely. The Go-Go-Go panto is perfect for this one. Love it! My 4 year old told me he wants another I spy quilt to play I spy with. Your Eye Spy quilt looks fabulous, Val. I love Kash's name on it. He is going to love his quilty hug! What a fun quilt, and you are so right, they grow so fast!! Such a fun quilt! Thanks for linking up with Elm Street Quilts One Monthly Goal and congrats on your finish. Very cute finish! I know it will be loved and used for a long time! I Spy quilts remind me of the quilts my mom made when I was younger and I would "I Spy" all the different fabrics from clothes she'd made for all her daughters. It was always so fun! Your quilt looks amazing and will be such a sweet gift for the baby. It turned out great! I love seeing finished I Spy quilts! I am sure Kash and his family will treasure the quilt for years to come. And that panto is just too cute! I looked through my stash tonight to start picking out I Spy fabrics. Does it matter if some are duplicates from your last swap? I don't remember exactly what I sent, but I have seen a few in your pictures that I think were mine and I still have some of the fabric. I'm looking forward to it!! Congratulations on finishing your May goal. It's an awesome eye spy quilt. I love the name. It makes it really special. Tuesday Archives #194: Mark Your Calendars!